A batch of mixed economic data was released this week and last that underlines continued strength among U.S. businesses and manufacturers. But consumer confidence still seems to be held back by the global slowdown, central bank policy concerns and other factors. This suggests investors should remain cautious and might want to consider assets that have demonstrated an ability to preserve capital in times of uncertainty—gold and short-term municipal bonds among them. For the third straight month, consumer confidence slipped on fears that the days of cheap gasoline might be coming to an end. 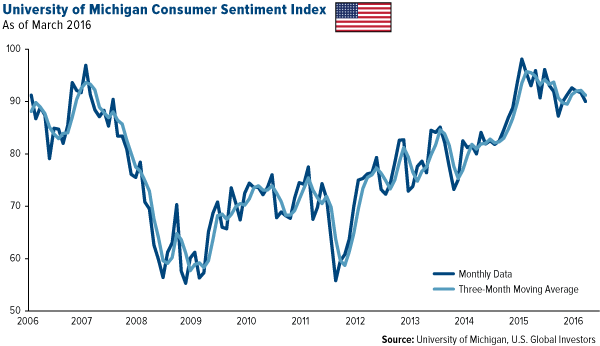 The University of Michigan’s Index of Consumer Sentiment fell to 90 in March, down from 91.7 in February. Although it’s still above recession levels, the index has been trending down for the past 12 months. 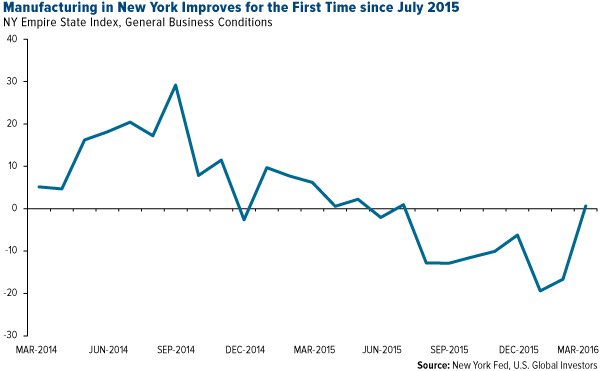 Conditions improved for manufacturers in New York State, according to the monthly Empire State Manufacturing Survey. Many investors pay attention to this metric as an indicator of industry health in the very influential New York region of the U.S. The headline reading climbed 17 points to its first positive score since July of last year, with significant improvements in new orders and shipments. Manufacturers also said they were more optimistic about business conditions six months out. But overall industrial production told a slightly different story. Activity fell 0.5 percent in February month-over-month, and as I explained earlier in the week, industrial production is a subset of GDP, which indicates where the markets have been. Housing data was also mixed. On the one hand, we saw a higher-than-expected rate of new housing starts in February. Single-family homes led the way, rising from 767,000 in January to 822,000, the highest print since the end of the recession. This helped push the total number of homes to 1.18 million, a 5.2 percent increase from January and an impressive 30.9 percent jump from the previous February. At the same time, existing-home sales dropped a substantial 7.1 percent in February, according to the National Association of Realtors. Low supply levels and price growth were the leading culprits. The most welcome news was that the core consumer price index (CPI)—which excludes food and energy—rose 2.3 percent year-over-year in February, representing the fourth straight month of inflation and the highest rate since October 2008. As I’ve pointed out many times before, gold has tended to respond well when inflationary pressure pushes real interest rates below zero. 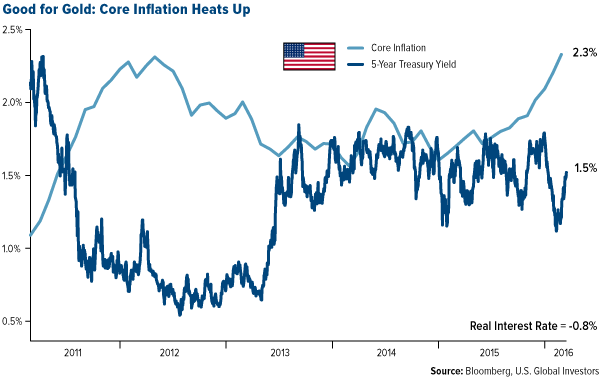 To get the real rate, you subtract the headline CPI from the U.S. Treasury yield. When it’s negative, as it is now, gold becomes more attractive to investors seeking preservation of their capital. The yellow metal has risen more than 17 percent so far this year, making it one of the best performers in 2016. 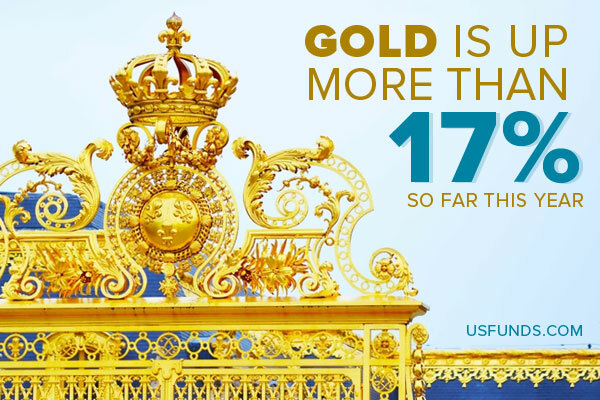 Previous Article If government trusts gold so much, shouldn’t you?